In a world of conflict and strife, how can we be advocates of peace and justice? In this volume acclaimed scholar-monk Bhikkhu Bodhi has collected and translated the Buddha's teachings on conflict resolution, interpersonal and social problem-solving, and the forging of harmonious relationships. The selections, all drawn from the Pali Canon, the earliest record of the Buddha's discourses, are organized into ten thematic chapters. The chapters deal with such topics as the quelling of anger, good friendship, intentional communities, the settlement of disputes, and the establishing of an equitable society. Each chapter begins with a concise and informative introduction by the translator that guides us toward a deeper understanding of the texts that follow. In times of social conflict, intolerance, and war, the Buddha's approach to creating and sustaining peace takes on a new and urgent significance. Even readers unacquainted with Buddhism will appreciate these ancient teachings, always clear, practical, undogmatic, and so contemporary in flavor. The Buddha's Teachings on Social and Communal Harmony will prove to be essential reading for anyone seeking to bring peace into their communities and into the wider world. Ven. 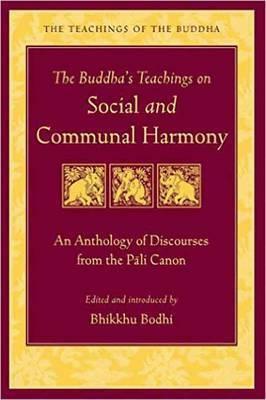 Bhikkhu Bodhi is the premier English language translator of the Pali Canon. An American Buddhist monk from New York City, he born in 1944. He obtained a BA in philosophy from Brooklyn College and a PhD in philosophy from Claremont Graduate School. After completing his university studies he traveled to Sri Lanka, where he received novice ordination in 1972 and full ordination in 1973, both under the leading Sri Lankan scholar-monk, Ven. Balangoda Ananda Maitreya (1896-1998). From 1984 to 2002 he was the editor for the Buddhist Publication Society in Kandy, where he lived for ten years with the senior German monk, Ven. Nyanaponika Thera (1901-1994), at the Forest Hermitage. He returned to the U.S. in 2002. He currently lives and teaches at Chuang Yen Monastery in Carmel, New York. Ven. Bodhi has many important publications to his credit, either as author, translator, or editor. These include The Middle Length Discourses of the Buddha (Majjhima Nikaya, 1995), The Connected Discourses of the Buddha (Samyutta Nikaya, 2000), and The Numerical Discourses of the Buddha (Anguttara Nikaya, 2012). In 2008, together with several of his students, Ven. Bodhi founded Buddhist Global Relief, a nonprofit supporting hunger relief, sustainable agriculture, and education in countries suffering from chronic poverty and malnutrition. He lives in Carmel, NY.